This review was first published in the Oct. 13 edition of The Hamilton Spectator. To the runners go the spoils. Picture your organization as a bus straight out of the Flintstones. Powering your Bedrock Express are four kinds of employees – runners, joggers, walkers and riders. Runners are your high performers who consistently go above and beyond for the good of your organization. 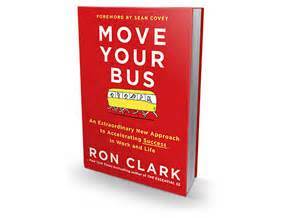 “Within every type of organization, it is the runners who provide the locomotion,” says Ron Clark, an award-winning teacher, author and consultant. Joggers are solid, if unspectacular. They can pick up their game if needed but not at the same intensity or the same duration as runners. Walkers mail it in. “They plod and stumble and don’t even keep up with the joggers,” says Clark. Walkers constantly criticize and complain in a bid to deflect attention away from their lackluster performance. Riders are dead weight. “Riders do not care about the overall success of the organization. In fact, they don’t even care about their own personal success,” says Clark. The only thing riders bring to their job is a sense of entitlement. Your leader drives the bus. To make the wheels on the bus go round and round, she needs to get the best from everyone on board. Giving the lion’s share of promotions, plum assignments, bonuses and perks to your runners can be a tough sell. What should you say to anyone who cries foul? Clark recommends cutting your runners some slack. They’re going to make mistakes. They’ll likely make more mistakes than all your joggers, walkers and riders combined because runners take on more work and tackle bigger challenges. You can also make life easier for your runners by assigning low value grunt work to walkers and riders. Clark offers practical advice for joggers, walkers and riders looking to join the ranks of runners. Strengthen your work ethic. Learn how to accept criticism. Listen more than you talk. Get to work and meetings early. Exude a sense of urgency. And lose the sense of entitlement.